The first selection in the Stats Accumulator with Paddy Power from Fairyhouse is in the Grade 3 Juvenile Hurdle over 2 miles and we have gone with Commander Of Fleet to win. This three year old could be a potential superstar for the yard after winning on the flat in April at Navan and then starting over hurdles this year and bolting up at Down Royal beating some smart juveniles. Gordon Elliott thinks highly of this horse and has B J Cooper in the saddle and when they work together which is not that often anymore they are running at a 33 percent strike rate for the last 12 months. The second selection in the Stats Accumulator with Paddy Power from Fairyhouse is in the Grade 1 Royal Bond Novice Hurdle over 2 miles and we have gone with Commander Of Fleet to win. Three starts; beginning with a win in an Irish point-to-point, he then breezed home in the Land Rover Bumper at Punchestown in April, before making a winning start at the same venue over hurdles a fortnight ago. The vibes are sky-high with this 4yo, who just after one run over timber in a maiden, is already the favourite to follow in the footsteps of stable companion Samcro, with a success at Cheltenham in the Ballymore Novices Hurdle. Gordon Elliott has a superb record when teaming up with his number one jockey Davy Russell as over the last year they have been working at a strike rate of 22 percent. Davy Russell loves it at this track and has a record of 29 percent for his runs at Fairyhouse. The penultimate selection in the Stats Accumulator with Paddy Power from Fairyhouse is in the Grade 1 Drinmore Novice Chase over 2 mile 4 furlongs and we have gone with Delta Work to win. This five year old gelding made a superb seasonal return by landing the Beginners Chase at Down Royal at the start of November. That was his first go over fences and if building from that performance will be hard to beat today. 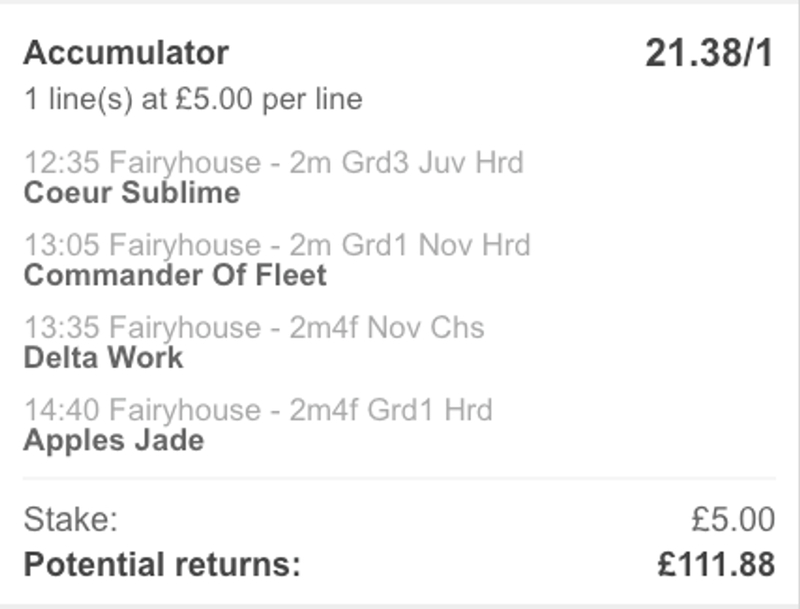 The last selection in the Stats Accumulator with Paddy Power from Fairyhouse is in the Grade 1 Hatton's Grace Hurdle over 2 mile 4 furlongs and we have gone with Apple's Jade to win. This six year old mare has been a superstar for the Gordon Elliott yard and is known for turning up in the big races and especially this one after winning this for the last two years and is looking for her hat trick today. 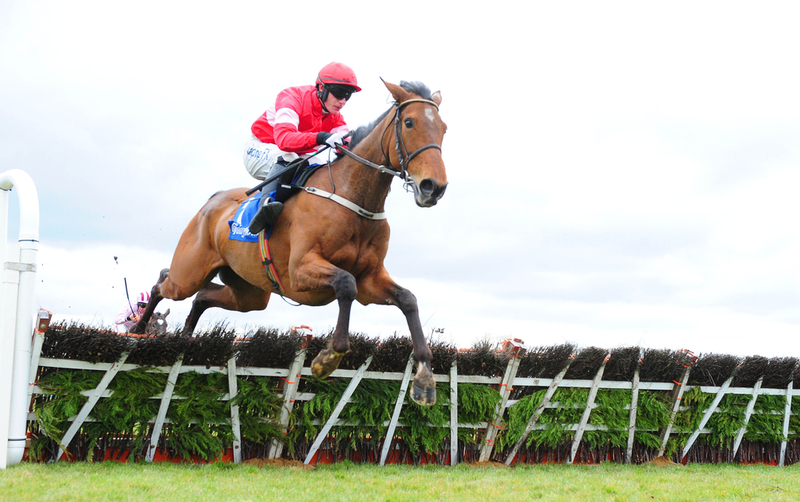 She made her seasonal debut at Navan at the start of November and showed that her blip last season did not last for long and went on to take the Lismullen hurdle easily.